Pat, and the other two submissions on this page are working in the small KLIK snap bezel. With about 1/2 inch of canvas, they still managed to create some tiny art. Pat’s vintage witch is surrounded by some very tiny black sequins as a border. There is even a miniature bat to complete the scene. Amanda collects skeleton keys and wanted to show her love for them and vintage antiques with this submission. The pearls are completely embedded because of the wonderful dome on this bezel. This post is via Resin Crafts Blog. 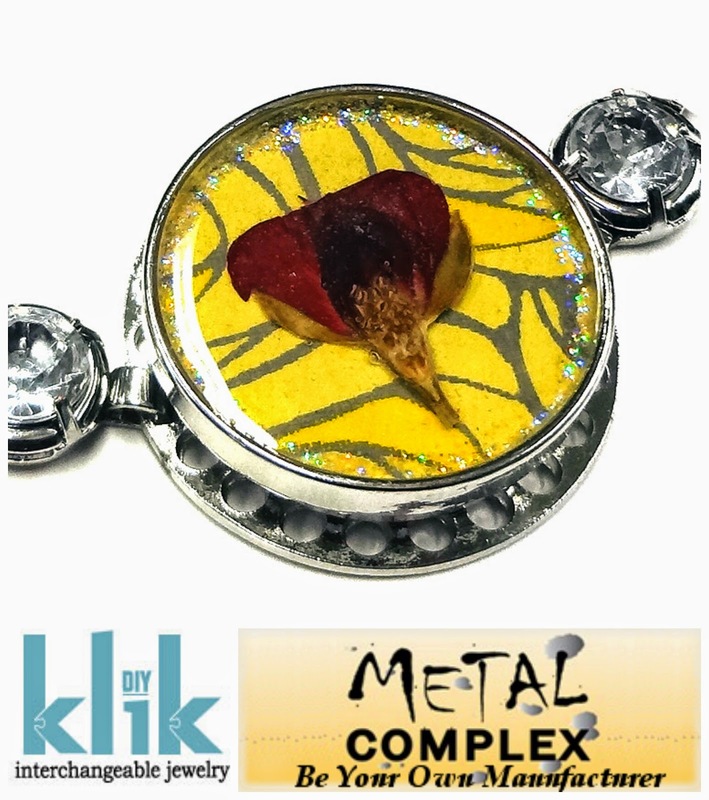 Today I am sharing the first two artist submissions for our fall KLIK collaboration with Metal Complex. Above you see the blank snap bezel everyone was sent. You won’t believe what Resin Crafts Blog readers created with them! Marie embedded something I just love….tatted lace. This form of needlework is extremely difficult to do. These tiny works of art can be permanently showcased in jewelry by embedding them in resin. The edge of her bezel is lined with glitter. The colour of her lace requires no additional embellishment, it just pops because Marie lined the bezel with a piece of reflective paper. It was difficult to photograph! Marie also sent me some extra lace! Thank you! In all the years I have worked with resin, I have never been as mesmerized as I am with this submission. It is so simple, but oh so effective. The black and white swirl is indeed hypnotic. This gives me so many ideas for future projects! Earlier this summer I posted a call for Resin Crafts blog artists/crafters to join in the 2014 collaboration project with Metal Complex. With very little information, I had well over 50 volunteers for the project. I had to extend the project to make room for 20 more participants. They are all receiving a blank metal snap to experiment in. 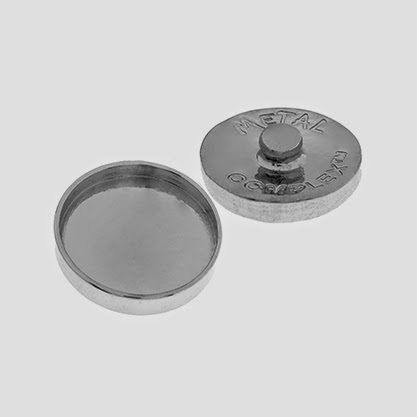 The snaps are part of the new DIY product line from Metal Complex. 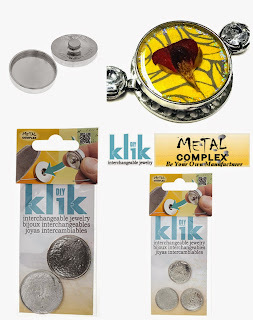 These metal components “klik” into interchangeable jewelry and you can read more here. I have had so much fun creating samples for the campaign! My studio has been filled with circular imagery that I am punching out and placing into my blank bezels. There are some shallow snaps as well and I am embellishing these edges with a little bit of glitter glue. I am pouring Jewelry Resin into my snaps to create these gorgeous finished components. Since the snap blanks have a little “nubbin” on the bottom (which allows them to be “kliked” in place) I have set up some boards on my table to create a channel so when I pour resin in, the snaps are level. I have started to make series! These snaps mix and match! As you can see, I have dozens of options for my finished snaps. I can’t wait to see what our klik participants will be making! I’ll be featuring each project on the blog and Facebook throughout September! Our collaboration participants received the snap blanks before anyone else in North America. Metal Complex is just starting to ship orders to companies now. Just a reminder, they are a wholesale company, so they do not ship to consumers. 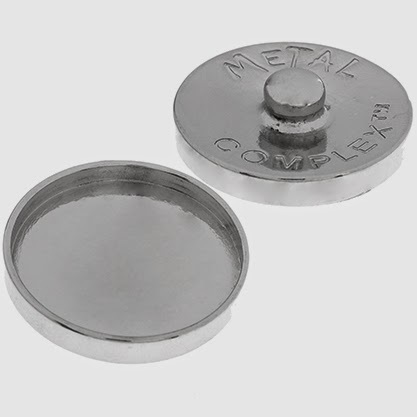 For more information or to find a reseller near you please email: info@metalcomplex.com. 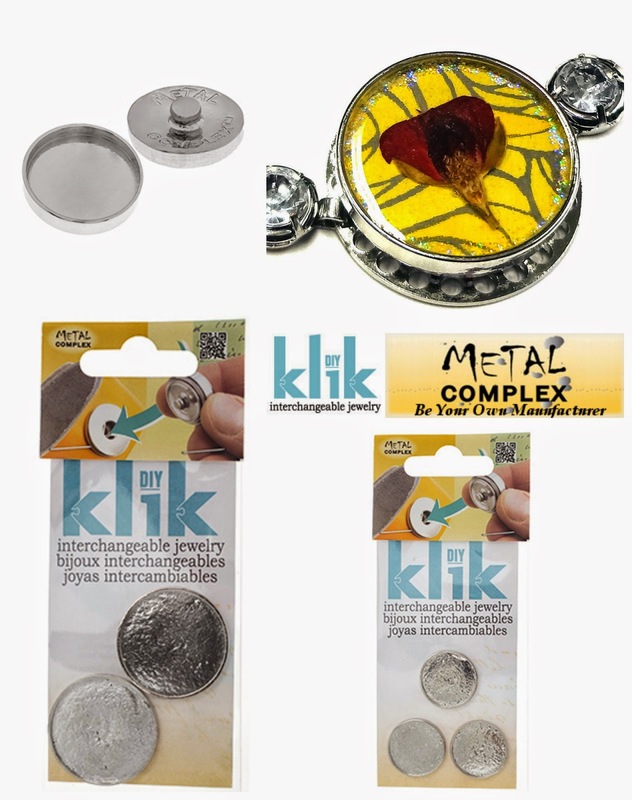 Your personal touch is “just a Klik away” with the launch of our new product range cleverly titled “Klik.” Sensational new looks can be created and then modified with interchangeable jewelry. Jewelry can be quickly assembled by the DIYer looking for a unique and coordinated jewelry line to craft with. Established jewelers are going to love our exclusive bezel snap which is ready to be filled with just about anything. The options to wear your Klik snaps are also plentiful! 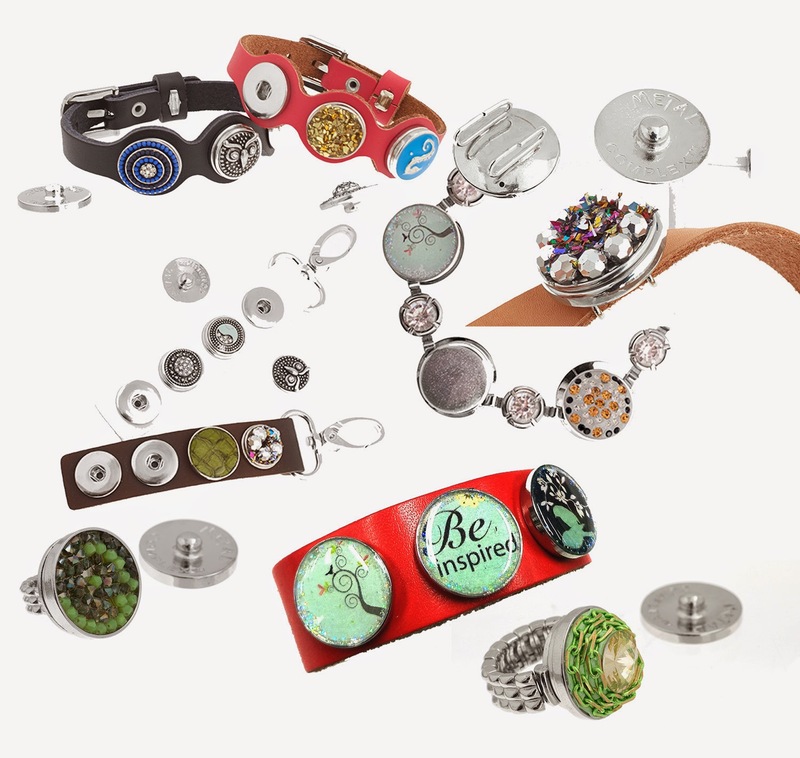 We have stretch band rings, earrings (several designs), pendants, combo pendants, connectors, sliders, clasps, and toggles. The leather options include bracelets, cuffs, and key fobs in a dazzling array of colours! An exclusive addition is our Metal Complex snap bezel blank in two sizes. These are for the DIY crafter and designers who want to create their own snaps using cabochons, glue, resin, and epoxy clays. We’ll be featuring many how-to projects on the blog highlighting this truly unique and exclusive design. Author Carmi CimicataPosted on July 28, 2014 Categories KLIKTags KlikLeave a comment on KLIK!